Dual, Full view, Vertically sliding, laminated safety glass sashes with counter-balanced, smooth efficient movement with full-width finger pull. The Airfoil Bypass Hoods have a double bypass to provide constant exhaust volume and limit changes in face velocity. 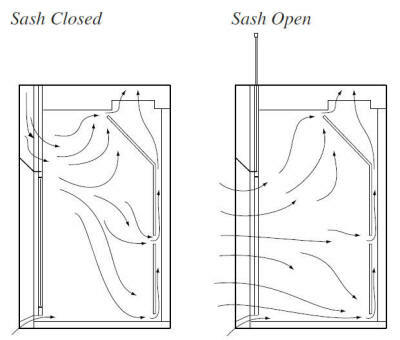 The upper bypass functions automatically with the raising and lowering of the sash. The lower bypass provides a continuous air sweep of the work surface. When hood top enclosures are used, a bypass grille must be specified.